A senior Iranian official on Wednesday warned of an impending "third world war" that will be sparked by terrorists, according to regional reports. 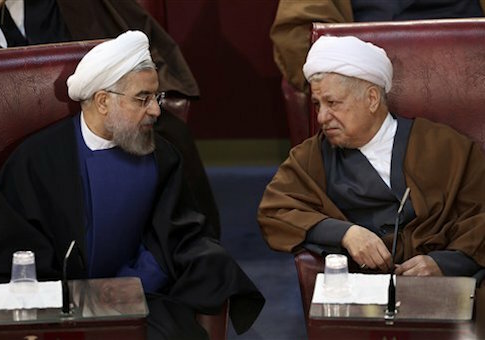 Akbar Hashemi Rafsanjani, the chairman of Iran’s powerful Expediency Council, warned in comments that the "outbreak of World War III" is coming in the near future, according to a report by Iran’s Fars News Agency. "The threat of the outbreak of the third world war by the terrorists is serious," Rafsanjani was quoted as saying in a meeting with Italian Foreign Minister Paolo Gentiloni, who was in Tehran this week for a meeting with Iranian officials. Rafsanjani blamed the United States and NATO for fostering the conditions that will lead to World War III. "The U.S. and the NATO had invaded Afghanistan to uproot terrorism and narcotics, but we saw that terrorism expanded in the form of the ISIL, Boko Haram and Al-Nusra Front to remote parts of the world from Al-Qaeda and Taliban in Pakistan and Afghanistan," he was quoted as saying. Rafsanjani went on to demand that the United States and other Western countries "stop their support for the terrorist groups" in the region. Iran and the United States are on opposite sides of multiple ethnic wars in the region, including in Syria and Yemen. However, the United States and Iran have found themselves allies in the war to defeat the Islamic State in Iraq. Italy’s Gentiloni welcomed Rafsanjani’s comments, according to Fars. "In my meetings with Iranian and Italian officials I will mention this and I hope that your proposal will be a starting point in inflicting a historical defeat on the terrorists in different human societies," he was quoted as saying. Iranian President Hassan Rouhani also has warned of the threat posed by terrorism, though he has not directly acknowledged Iran’s role in fostering much of it. "Terrorism and insecurity is an epidemic disease which doesn’t belong to a special region, and efforts should be made to encounter extremism and violence to prevent its spread and we shouldn’t allow any innocent person, regardless of his/her nationality and religion, to become a victim of the terrorist groups," Rouhani was quoted as saying following his own meeting with Gentiloni. This entry was posted in National Security and tagged Iran. Bookmark the permalink.